If your taste in computer bags sits somewhere near the corner of Design and Geek, then you might want to have a look at 25togo’s My Document computer sleeve. 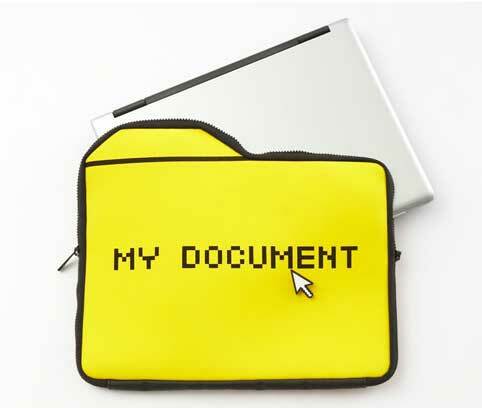 The My Document sleeves are fashioned after the style of a computer’s file manager folder icon. They’re available in 13.3, 14.1 and 15.4 inch sizes, made of neoprene, and lined with fleece. You can have any colour you want as long as it’s yellow. Pantone 128 if you’re colour-particular. It is anti-splash, shockproof and scratchproof. 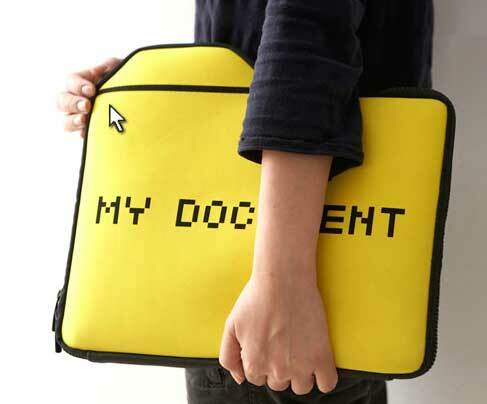 The My Document bags ship with one of three badges depicting classic cursor styles – an arrow, a hand, or an egg timer. The bags retail for around the US$30 mark, and can be purchased online at Amazon. Who knows Michael, maybe they’ll release a version for you – a Hidden File version, in a taupe colour scheme.